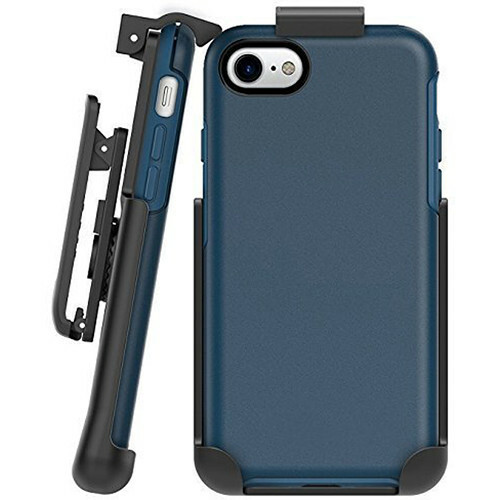 With the Encased Belt Clip Holster for iPhone 8 OtterBox Symmetry Case, you can keep your pockets empty and your Apple iPhone 8 secure, protected, and at hand for when you need it most. This belt clip holster is designed to hold your phone while it's still in its OtterBox Symmetry case, so you don't have to sacrifice the protection your case offers. The top of the holster features a quick release spring clip that's strong enough to securely hold your encased phone, yet still lets you single-handedly remove it when needed. When the holster is on your belt, you can twist the reinforced rotating clip to move your phone out of the way if needed. When not on your belt, the rotating clip can transform the holster into a smartphone stand. Simply rotate the clip so the phone is in landscape orientation, then squeeze open the clip and pull out the metal kickstand inside. The kickstand forces the clip to stay open, letting you rest the phone on a desk or table for watching videos, or place it on a nightstand to act as an alarm clock. Box Dimensions (LxWxH) 7.85 x 4.75 x 1.5"